It’s incredible how powerful smartphones have become. In fact, many of them are better than most entry level laptops on the market today. These smartphones have a faster processor, more connectivity (3G/LTE) options, and users can carry their entire video/audio libraries on the go. However, the laptop form factor, with its bigger screen and keyboard / trackpad / mouse, still offers a better productivity user experience than a smartphone. Consumers are more comfortable with the feel of a laptop for document editing, online learning, photo editing, and more. While efforts from various companies to create hybrid computers using smartphones such as the Motorola Atrix, Asus PadFone, and the Ubuntu One project offered a glimpse into the exciting possibilities of next-generation computing, they were ahead of their time. The smartphone’s computing power, and the OS running in “laptop” mode, did not satisfy the demands of mainstream consumers. Also, many users prefer purchasing smartphones from brands they love and then combining it with a productivity accessory, versus purchasing a new phone solely for that accessory. This is where MHL® comes into play. 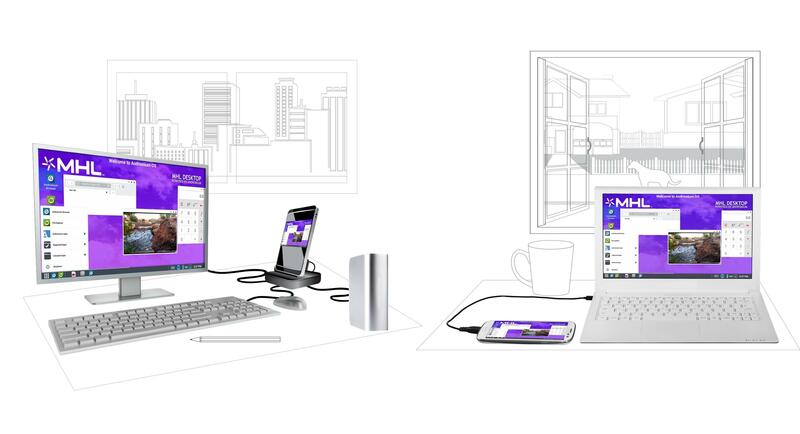 With MHL, you can place your smartphone in a dock that’s then connected to a monitor, keyboard, mouse and external storage. There are also smartbook accessories (basically shells) that give you the form factor of a laptop, but all of the processing power comes from the connected smartphone. In addition, MHL’s support of USB Type-C strengthens its foothold in the productivity space with future products able to connect to MHL’s large ecosystem of more than 750 million devices. Beyond the hardware form factor, a new software/OS is also critical to enable users to take full advantage of the “laptop mode” of their smartphones. Because of this, MHL is working closely with companies such as ours (Andromium Inc., the maker of Andromium OS). With Andromium, your entire desktop, OS, and files are with you. Our software is optimized to allow you to use powerful and sophisticated programs without worry, and without the limitations of a five inch screen. We’ve teamed up with some of the top User Interface and User Experience designers in the industry to take the best elements from Windows and OSX environments to create a sleek, intuitive experience that highlights Andromium’s functionality and power. Now that both the hardware and software are aligned, the perfect productivity storm is brewing. We’re finally ready for the future, where one device (our smartphone) can serve as the nexus of our digital life!